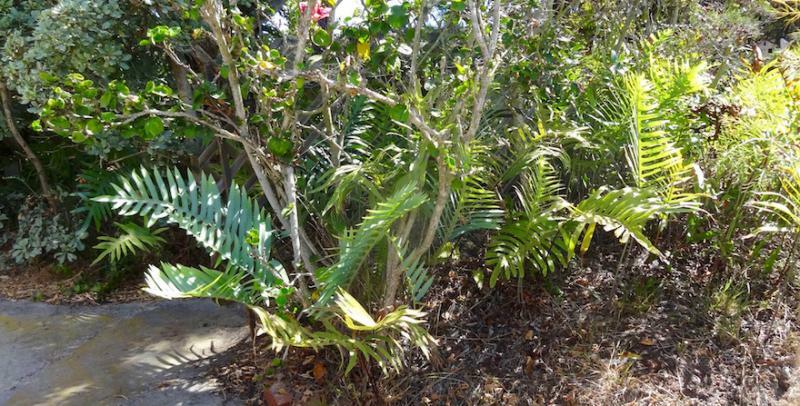 (Click underlined title to see more pictures and info) Phlebodium aureum, fern, standard form, in landscape in Pt. Loma, in a sort of 'habitat styling'. Goes great with Malvaviscus, which is a few entries before/below in this blog. Both are native to southeast North America through portions of gulf-region Mexico, Central America, Caribbean, and northern South America. This landscape(3 in-ground photos) was installed about 30 to 40 years ago,.. or more, by Sinjen, the famed eclectic-eccentric landscape-designer-installer-lacer-upkeeper, in San Diego, mainly from the 1950's through the 1990's. 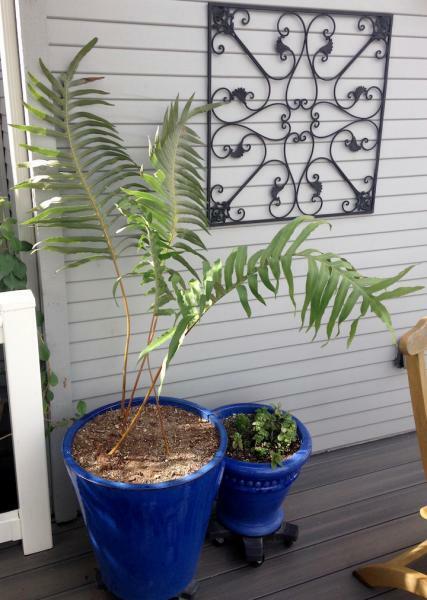 The potted photo is one I planted for another client. 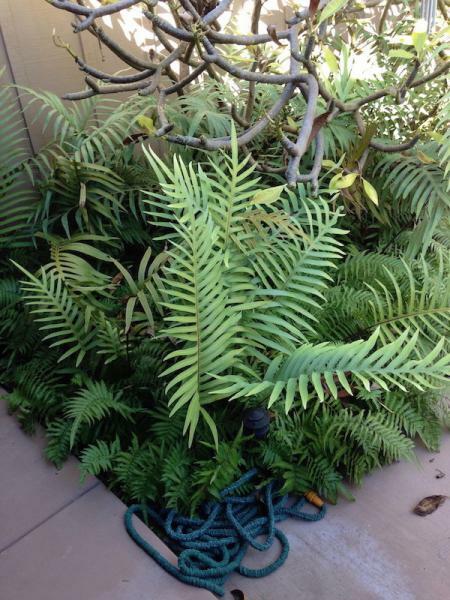 This form of Phlebodium aureum is the 'cleanest' form, which for whatever reason is rarely, and I mean really rarely, ever sold in nurseries, except when I make them avaible from plants I propagate at home, to Walter Andersen Nursery, San Diego,.... although it's a superb landscaping fern, with only moderate watering requirements. Other forms of this species are sometimes sold in nurseries, such as a blue dwarf-ish clean form, which is really nice,... and I've also seen a couple or few other green forms of which there's a more weeping form, a dwarfer-green form (which also seems to be more 'tattery', not so smooth and upright/erect), and another sort of ruffley form. But, except for the blue dwarfish standard form, the other varieties aren't as desirable for landscape use, other than in pots. So, the particular variety of this Genus-species, is a major factor in it's landscape usage desirability. It can grow in shade to sun, more accepting of sun by the coast, but doesn't like much intense sun, though it can take a fair amount. 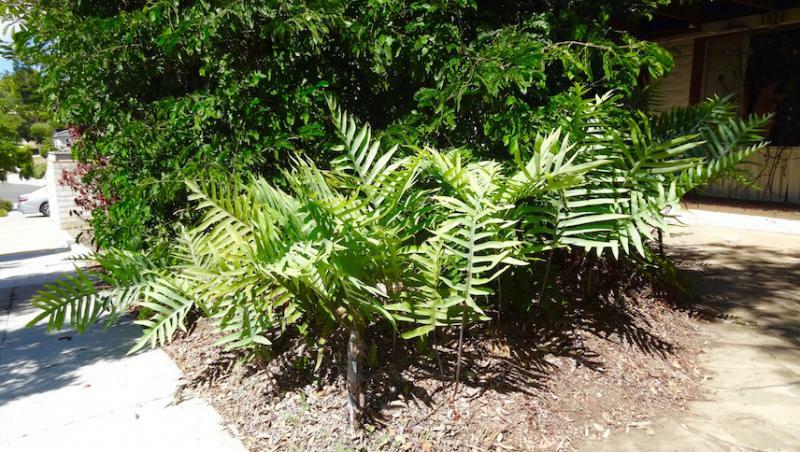 Moderate water requirements, - not as thirsty as most other ferns. It's a rhizomatus-creeping fern, though not particularly fast, potentially can spread a foot a year at most, typically, with adequate watering.